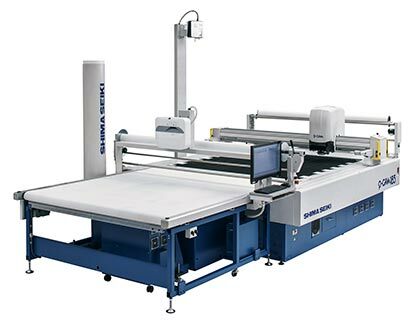 SHIMA SEIKI will exhibit its P­CAM183 multi­ply computerized cutting machine (NC cutting machine). Fast and efficient with high productivity, P­CAM’s multi­ply cutting capability allows up to 3 inches (80 mm) of fabric or material to be cut, while the standard turbo fan suppresses fluctuation in air pressure for stable multi­ply cutting. A knife sharpening system produces a sharp, strong blade every time. Strong, robust components permit quicker response times for knife movement and more accurate cutting for thick fabrics such as denim. P­CAM machines are ideally suited to global pro­ duction in a wide range of industrial applications in addition to apparel and textiles. Also demonstrated at SaigonTex will be SHIMA SEIKI’s SDS­ONE APEX3 computer design system. The full­featured APEX3 provides smooth and efficient workflow from patternmaking, grading and marking to cutting. New PGM soft­ ware is available for demonstration, featuring newly organized functions and menu layout for a more intuitive user interface, resulting in an average of 40 per cent higher productivity. Highly efficient “AutoMarking Premium” nesting software, as well as barcode generation are available for efficient marker generation and pick­up. APEX3 is also capable of photo­realistic product simulation for creating 3D virtual samples that can be used for accurate checking of toile fab­ rics. Virtual Sampling minimizes the need for actual sample­making, reducing time, material and cost while increasing presentation quality in the sampling process. APEX3 supports design and simulation in a variety of textile industries including flat knitting, circular knitting, weaving, pile weaving and printing, as well as industrial design.